In this week’s roundup of campaign examples, you’ll see creative uses of our some of our most popular templates. Our template gallery has more than 40 beautiful, readymade templates just ready to be customized and these examples will give you an idea of how you can make them your own. Fans of the popular “So You Think You Can Dance” TV series become super excited before the premiere of a new season, at the end of a season, and when the cast goes on tour. Durham Performing Arts Center knows this, and they created a campaign centered around the show’s Season 14 tour. 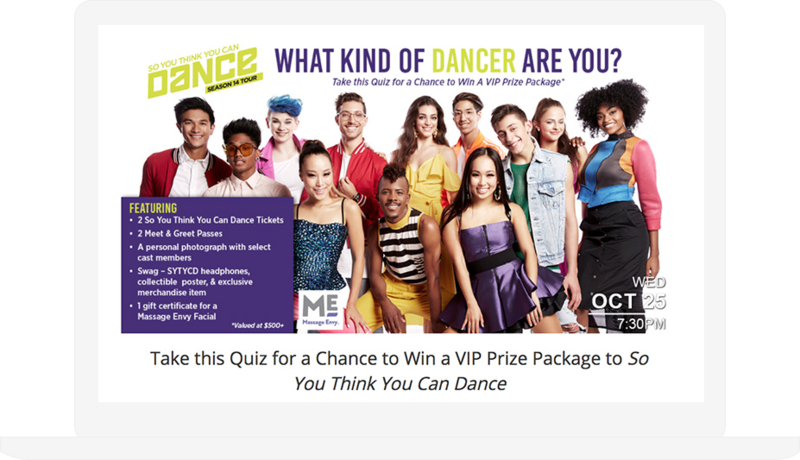 Fans first take a quiz to find out what type of dancer they are. In order to see the results, quiz takers must fill out the entry form which in turn grows Durham Performing Arts Center’s email marketing list. Collaboration with other brands can help promote your contest and add to the excitement by allowing you to offer a more attractive grand prize. 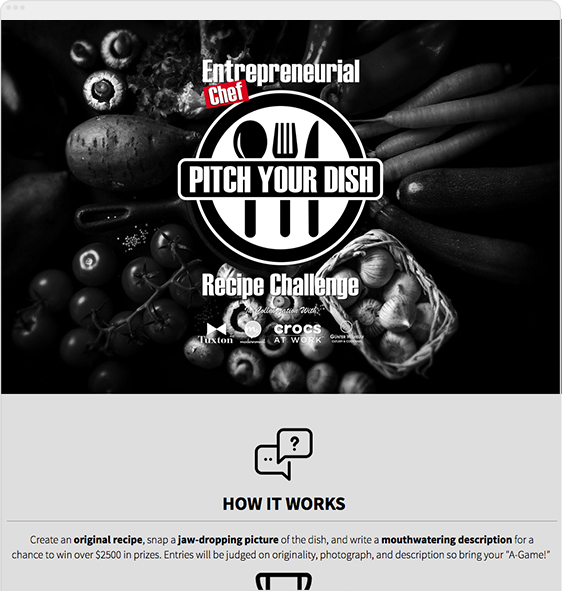 Entrepreneurial Chef’s “Pitch Your Dish” recipe challenge is a perfect example. Entrepreneurial Chef collaborated with four other brands to give away more than $5,000 in prizes. Better yet, recipe contests are so versatile — they’re a perfect fit for Halloween, Thanksgiving and Christmas. Plus, they encourage the submission of user-generated content, which increases engagement and gives your product valuable “social proof” to help your marketing all year long. Do you offer something that is just plain better than the competition? Let your customers know! Daisy Cottage Cheese is made from the most simple ingredients — cultured skim milk, cream and salt — a fact that sets them apart from their competition. 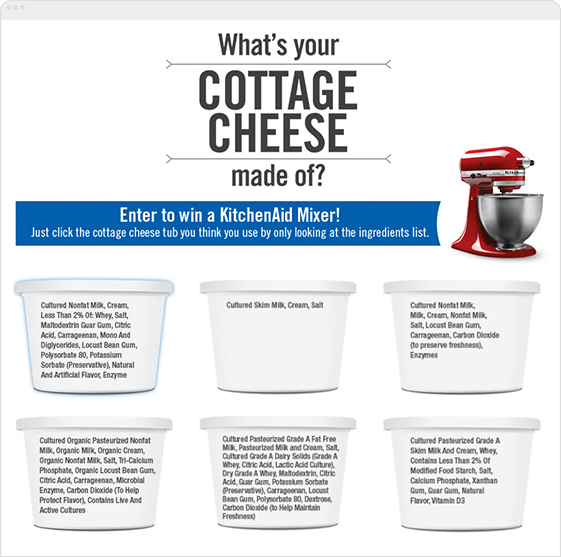 The “Daisy Difference” sweepstakes is designed to make customers aware of what goes into their cottage cheese and encourage them to experience the brand’s quality. Use our email autoresponders to instantly send people entrants a coupon for your product or service. You get an email address, they get a great deal. Any time you run a contest, you want to make sure you’re not breaking any laws, or breaking the rules laid out by specific social networks. The list at the end of this post gives you an idea of what to include. We recommend posting your rules on a landing page like this one. Some states/regions have specific rules and guidelines for businesses that give away any prize, including prizes won via Facebook contests. Check with your region’s business agencies to ensure that you’re abiding by local, state and international laws. Your rules should make clear that your business is the sponsor of the contest. The rules should also explain that by participating in your contest, entrants agree to abide by all of your contest rules and regulations. If necessary, specify age and residency restrictions in your rules. Include a month, day and time for when the contest will begin and end, and when the winner(s) will be selected and announced. If your promotion has several entry periods include the dates for each individual portion of the contest. This description becomes especially important if you’re running a contest in which people are entering a photo or video that will be judged and then voted on by the public. You want to include the dates for entry and voting. It seems simple enough: Fill out the information and you’re entered! 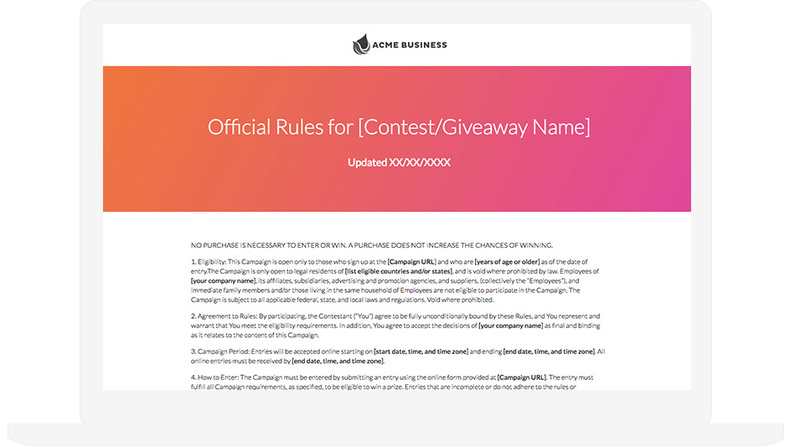 But giving direct rules about how to enter a contest and letting fans know they must complete all required fields in order to successfully enter a contest, ensures that an entrant understands exactly how and where to enter. Specify how you will select a winner, including all judging criteria and rounds of judging. Provide a list of the prizes that the winner will receive and outline the process of how that prize will be distributed. For example, if the eventual winner will receive an email notification and must provide a valid mailing address to receive a prize, include these details in your rules. Sometimes shipping can be expensive and complicated, so we always include a section in our rules stating that any incidental expenses and all other costs and expenses not specifically listed as part of the prize are the sole responsibility of the winner and not the sponsor. We also recommend letting your fans know that their prize is not exchangeable for cash (assuming that it’s not!). Additional limitations can include disclaimers stating that you have the right to adjust or shut down the contest at any time, and you have the right to investigate possible cheating or tampering before you determine a winner. If you’re collecting data about your fans, such as an email address or birthday, include in your rules that by participating, each participant is granting your business permission to use his/her/business name, contest entry, likeness or comments for publicity (or future marketing purposes). If you’re collecting user-generated content and you hope to use some of the content you collect for future marketing, make sure you obtain rights to use the photos, images or text you collect. If you have any questions about how and where to publish contest rules, shoot us an email.